One of the great things about the JAG series was that the season would include a Christmas episode, a tradition NCIS continues to this day. When God revealed himself to us, he did so through a family; which is why I speak to you tonight of Joseph… the forgotten man of the Christmas story. We know much about Mary and, of course, the Christ child. But the Bible makes few references to the life of Joseph. Therefore, he remains somewhat of a mystery, much as many of our own fathers do. But we do know that Joseph was a gentle father and a courageous man. He saved his family from Herod by taking them on a dangerous journey to Egypt. He taught his son his own trade, as fathers do even today. Joseph died before Jesus grew up to become a man and begin his ministry. Yet, Joseph still believed ‘blessed are those who believe that he will bind up the brokenhearted and free the captives.’ At best, a father is the solid foundation of a house, his support taken for granted. At other times, he may need shoring up himself. He may be tired, he may be impatient, he may be mired in his own problems, but always a father looks beyond the here and now. He keeps one eye trained on the next generation. Of necessity, he is a man filled with hope – Hope that a knowing God watches over the universe; hope that justice will prevail; hope that we will be reunited with our loved ones. As Saint Paul said, “Abide by these three: faith, hope, and love. The greatest of these is love.” So when we give thanks to the Father for our blessings, let us not forget Joseph, or our own fathers, that they may not be forgotten this Christmas. May God bless you and Merry Christmas. 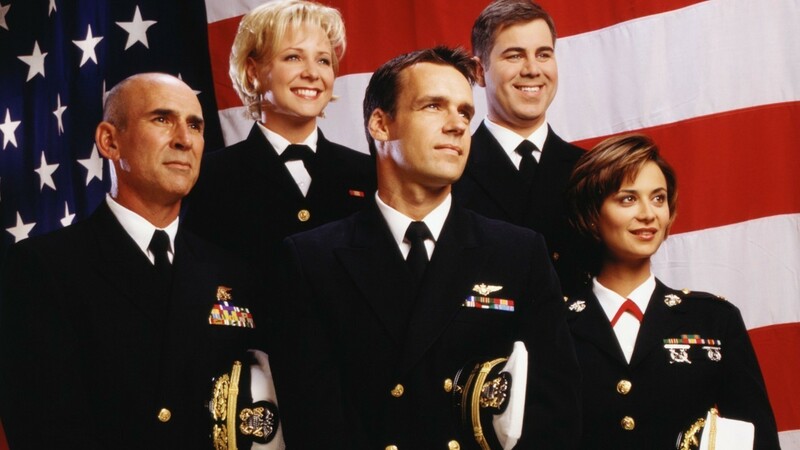 This entry was posted in Holidays, TV Shows and tagged Answered Prayers, Bill Cobbs, Catherine Bell, Christmas, Christmas episodes, David James Elliot, Holidays, JAG, JAG Corps, John M. Jackson, Judge Advocate General, lawyers, Navy chaplains, NCIS, Patrick Labyorteaux, pilots, sailors, Scott Lawrence, Season Seven, ships, Tracey Needham, TV Shows, U.S. Marines, U.S. Navy, Zoe McLellan on December 15, 2015 by The Mithril Guardian.